Richards Bay - Eleazar Rodgers’s early goal was enough for Santos as they began the PSL promotion/relegation soccer playoffs with a narrow 1-0 victory over Thanda Royal Zulu at the Richards Bay Sports Stadium on Wednesday. The visitors dominated the first half and went in front via a quick counter-attack, but they had to defend for the majority of the second 45 minutes as the hosts went in search of an equaliser. 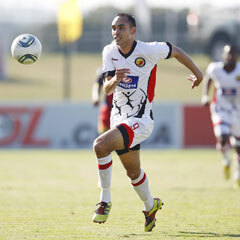 The result gave the People’s Team all three points in the new league-style playoffs, which include Chippa United. Martin Nooij’s men controlled the game early on and went in front after 11 minutes when Salmaan King was sent scurrying down the left wing during a quick counter-attack forward and the winger played in Rodgers to score from close range. The same two players again came close, with King firing wide from distance and Rodgers heading just over. Nasief Morris had the best chance to double the advantage when he headed a corner to the back post against the left upright. Thanda tested Pa Dembo Touray in Santos' goal 10 minutes before the break when Edwin Sitayitayi’s shot from a wide angle on the right was punched away by the falling Gambian. It was 1-0 at the break and despite dominating the second 45 minutes, Thanda lacked any cutting edge in front of goal. They took several wrong options in key areas, with Itshegetseng Lehumo and Sitayitayi being the guilty men. At the other end, Shafeeq Arendse had a chance to kill the game later on, but struck the upright as Santos held on.